Note 1: All UTM coordinates are zone 12 and use the NAD27 datum. Note 2: Click on any photograph for enlargement. Note: Please skip this section if you are only interested in climbing Gannett Peak. This climb was part of a larger road journey where I visited several county highpoints including Gannett Peak as the "main event". A general review of this trip is available. 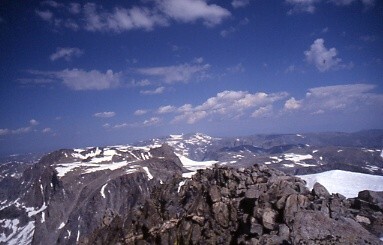 Gannett Peak is the highest point of Wyoming's remote Wind River Range. Nonclimbers tend to match up Grand Teton with thoughts of Wyoming mountain majesty. Little do they realize that Gannett is the higher, albeit by a mere thirty-four feet. Gannett Peak also has 7,074+ feet of prominence, substantial enough to place it fifteenth on the list of fifty greatest prominences in the forty-eight contiguous United States - the so-called America's Fifty Finest. Gannett Peak shares the honor of largest prominence for any Wyoming summit with Cloud Peak, the error range due to uncertainties in key saddle elevations precluding a definite winner. Gannett Peak is normally climbed over four to six days from any of several trailheads. Any approach is long, arduous, and guaranteed to tire even hardy individuals. The summit day involves travel over glacier, use of ropes, with high-angle snow and/or ice on all well-documented routes. Gannett Peak is subjectively considered to be the most difficult state highpoint in the forty-eight contiguous states, possibly sharing that distinction with Granite Peak of Montana. Do not take this climb lightly - it is remote enough that evacuation of an injured climber would be a major undertaking. Furthermore the weather can change rapidly, with frozen precipitation possible any month. Numerous hyperlinks are provided to trip reports; photographs; and more. by Don W. Holmes. Cordillera Press, Inc., Evergreen, Colorado (1990). I had planned, along with Chuck Bickes of Massachusetts, to climb Gannett Peak the previous year. Chuck, a state highpointer, had but two summits remaining to earn fifty state completion status - an accomplishment of grand proportion seeing as Mount McKinley, highpoint of Alaska and North America's highest summit, is required. Chuck had already scaled McKinley, and, with only Idaho's Borah Peak and Gannett Peak remaining, was eager to finish the list. In 2003 the opportunity arose for Chuck to join a Mount Everest expedition. With no intention of reaching the summit, Chuck wished to fulfill his dream of traversing the treacherous Khumbu Icefall on Everest's lower slopes. This he did, reaching advanced base camp at some 20,000 feet. Unfortunately this adventure bankrupted Chuck's vacation allowance, forcing a postponement of Gannett Peak to the following year. Springtime dialogue focused on deciding the approach route for Gannett Peak. Eventually Chuck and I agreed to a loop route wherein entry would be via the shorter Ink Wells Trail, followed by exit via the considerably longer Glacier Trail. The Ink Wells Trail required crossing Indian lands, and an Indian outfitter would charge us for the drive to the trailhead. In compensation we would have the highest starting elevation and the least horizontal distance of all possible approaches. Since previous Gannett Peak trip reports complain about brutally heavy packs, it seemed prudent to spend $100-$200 per person to arrive at high camp relatively fresh. Chuck and I tried hard to recruit additional people because there is safety in numbers on a remote, ice-clad mountain. Surprisingly, I had no success in recruiting county highpointers to the task, and this despite the fact that there were several people who had Gannett Peak on their wishlist. Part of the problem, I surmise, is that climbing Gannett Peak requires a full week of vacation time from work, a week that could be filled with several lesser hikes and/or less strenuous activities than the consecutive twelve hour days on one's feet which Gannett Peak offers. In contrast, Chuck recruited his friend Stony Burk, also from the East Coast. With three people we were confident that most problems could be addressed should they arise on summit day. 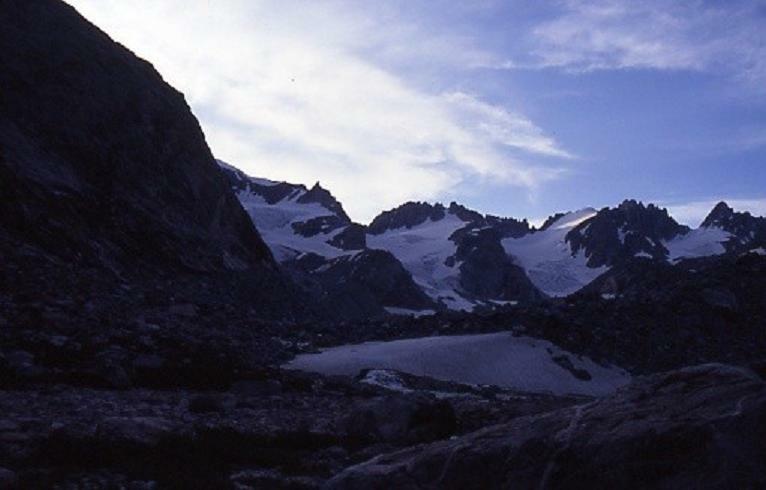 It is noteworthy that Chuck originally desired a traverse of the Wind River Range, via entry at the Ink Wells Trailhead; a climb of Gannett Peak; a carry of full packs over Dinwoody Pass; and exit at the Pinedale Trailhead on the south. This crossing of the Continental Divide would be a dramatic finish to Chuck's state highpoint quest. Unfortunately the placement of two automobiles, one at each trailhead, was required - and the driving distance between the two is some 180 miles. The additional time and effort suggested cancellation of this bold plan. By late afternoon Chuck appeared in his truck. He had successfully recruited three additional climbers to go with us, and I was introduced to all of them - Gordon Comstock from Michigan; and a brother-sister pair from the Netherlands. The brother, Sjaak van Schie, was poised to be the first foreign 48-state completer. The sister, Lidy, a nurse, is an extremely gracious and congenial person. I think that everybody immediately took a liking to her. Importantly, all the new team members had experience and a high level of fitness. Recalling how much I enjoyed huckleberry treats from after our climb of Granite Peak, Montana in 2002, Chuck presented me with a jar of huckleberry ice cream syrup! I immediately used it atop oatmeal raisin cookies to satisfy my yearning for carbohydrates since I had eaten little for lunch. I opted to join all at the nearest restaurant, one that served (standard) American fare. Although others enjoyed chicken-fried steak dinners (Lidy had a medium pizza), I ordered a meal-sized caesar salad into which I sliced garlic salami. My onion rings with BBQ sauce were delectable, as was the half-slice of cherry pie for dessert (there were four of us who wanted pie but only three slices left in the kitchen). Topped with sour cream from Sjaak's baked potato it was small but yummy indeed. Stony and I caravaned to the Glacier Trail parking lot, about a dozen miles, and I left my truck there for the exit day of our climb. As seen below this truck placement was never needed. There is much unfortunate paperwork required to enter via the Ink Wells trailhead. One crosses Indian land, and so a fishing license, valid for one day only, must be purchased in advance for $25 per person. Bring a driver's license - your description, including hair and eye color, is copied onto the stupid fishing license, one that never actually gets used. It is clear that this license crap is merely one way the Indians use to "get back at" the white man for all the terrible injustices he has wrought on the original inhabitants. Worse still, one has to purchase another fishing license for the day of exit, this time for $20 per person. How one can precisely judge the day of exit is beyond reason. One does however have the option of a one-week license, albeit at greater expense. The Indian outfitter charged us $120 per person for the opportunity to ride some 75 minutes in a delapidated pickup truck to the trailhead. After leaving route 26 the road journey is rough indeed - although not outside the realm of experience for a seasoned county highpointer. We were charged after returning to Crow Heart, home to Ramona the outfitter. Evidently $120 was the round-trip fee. Gordon, Lidy, Stony, Adam, Chuck. Sjaak is kneeling. Even though the six of us arrived at Crow Heart by 7:30 a.m., from Dubois, we were not on-trail until 11 a.m. - a dreadfully late hour given afternoon cloud buildup. I recommend that all paperwork be taken care of the day prior to hiking-in. 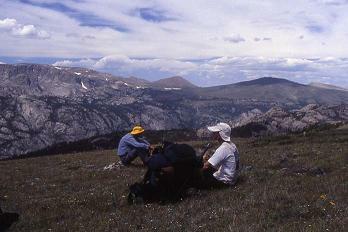 The Ink Wells trailhead is located at UTM (626521 E, 4792487 N), elevation 9,520+ feet with a 40 foot contour interval. The day's objective was to backpack two miles past the Glacier Trail / Ink Wells Trail junction. First we hiked to Scenic Pass at 11,400 feet, a distance of 4 1/2 miles. Then it is downhill another 4 1/2 miles to the aforementioned trail junction, the trail splitting into a higher and a lower branch before rejoining a few miles later. We took the lower branch, vowing to use the upper branch on our return. Cairns allow one to follow the route, particularly when crossing a meadow where the path becomes faint or seemingly nonexistent. Eventually we descended to make camp near the Glacier Trail / Ink Wells Trail junction, alongside Dinwoody Creek, at seven p.m. We did not travel the additional two miles towards high camp. Chuck decided to save pack weight by leaving a food cache strung up on a tree branch to avoid bear munching. Every person except myself added to the cache. Somehow I view the availability of food as a comforting thought - and did not wish to part with even a gram of the stuff. Chuck, Stony and I enjoyed a communal meal of pasta with spices and olive oil, for which was provided pepperoni, aged parmesan, dried tomatoes and garlic as mix-ins. Strangely the tomatoes had gone bad even though they were but recently purchased. I slept by nine o'clock alone in my tent. Gordon had brought his own tent even though I was willing to share mine. Go figure. I'm sure he had his reasons and, so long as safety is not compromised, I can go along with his decision. I've gone on several overnight journeys where the other person inexplicably brought his own tent - and I assume that it is a general phenomenon that has nothing to do with me personally. This short day saw us move camp six miles to the base of Gannett Peak. The stream crossings were a major headache, consuming much time and energy. We arrived at our 10,800 foot site, as the edge of the boulder field and morainal lakes, by three o'clock, having left camp some six to seven hours previously. Cross Dinwoody Creek from east to west using the obvious, well-constructed bridge. The Ink Wells Trail / Glacier Trail junction is then immediately at-hand at UTM (615793 E, 4788793 N). The trail stays on the north side of Dinwoody Creek for approximately four miles. Minor stream crossings are encountered in this stretch, and, again, it is not reasonable to describe them individually owing to seasonal variability. The trail crosses to the south side of Dinwoody Creek right where Gannett Creek flows into it from the west - UTM (612532 E, 4784475 N). Here you will encounter a maze of streams and, assuming that nobody in your party has been there previously, it is "highly unobvious" how to best proceed. Regardless of their locations or identities, if traveling on-foot several (up to four or more) individual crossings are required. If traveling on horseback, you are fortunate: the horse can follow the main path, wading in deeper water than you'd be willing or able to carrying a heavy pack, with only one crossing being performed. We established a high camp just where the greenery ends, at about 10,800 feet elevation and immediately prior to the boulder field with morainal lakes - roughly UTM (611826 E, 4782252 N). There is simply no reasonable place to camp higher in order to shave-off time on summit day. I had taken a spill at one crossing, my socks and boots then being dried out for the next day as I wore Chuck's leather boots around camp. Chuck had tennis shoes, and I had spare woolen socks. My goretex-based trousers dried out quickly just wearing them. Chuck, Stony and myself enjoyed a communal meal of cajun-spiced rotini pasta with roast beef mixed inside. I added plenty of melted butter for creamy texture, taste, and (at least for me) calories since I did not want to lose weight. I am extremely skinny to begin with and have virtually no reserve in case of trouble. Adam (in back) and Stony climb the steep snow chute. Gordon, Lidy and Sjaak ate their own meals since we planned upon being self-sufficient parties of three in case we had to separate. Specifically, Chuck, Stony and myself had the option of remaining for a second summit day in case of poor weather on the first attempt, followed by a two day hike out on the long (23 mile) Glacier Trail. 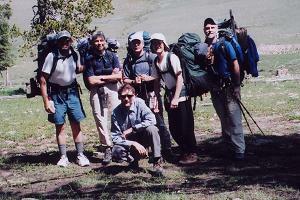 In contrast, Gordon, Lidy and Sjaak had to exit on day four of the trek. Thus tomorrow was their only shot at the summit. Having agreed upon a 3 o'clock bell with a 4 a.m. start, somehow I self-awakened at 2:57 a.m. without an alarm. Chuck and Stony had our usual morning repast of hot oatmeal with the individual, flavored packets (maple and brown sugar, cinnamon apple, fruit and cream varieties, etc...). Desirous of something new, I had Carnation Instant Breakfast with a granola bar, the cappuccino flavor being tasty hot on this mildly chilled morning (estimated temperature 40 F). Sjaak and Lidy always had boiling hot mugs of tea with their breakfasts and dinners. We were off at 4:16 a.m., picking our way for 2 1/4 hours by headlamp and moonlight through the boulderfield. It was slow going, especially after the moon set soon after starting out. We had to backtrack at one point, losing valuable time and energy, to avoid an even longer route around a lake's edge that we had already half passed. 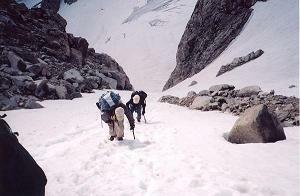 After daybreak and at the base of the Dinwoody Glacier Chuck's left crampon strap broke. Sjaak provided a temporary repair and we continued. Dinwoody Pass was broad and nearly level. Although we did not use it on our climb, it is clear that a traverse would have required negotiating that boulder field wearing full packs, so adding measurably to the required effort of summit day. The previous afternoon Chuck, Gordon and Sjaak hiked partway up the boulderfield, and determined that the standard route would take longer than what we ended up doing - unless we were willing to climb nearly vertical ice as a route variation. Thereby we foresook turning north which would have led us to the standard climbing route up the Gooseneck Glacier - and eventually to its bergschrund as the crux. Instead, we climbed the Dinwoody glacier, with the crevasse hazard small, unroped, to the base of a steep snow chute at 12,600 feet. We took a good fifteen minutes at the chute's base, and voted to leave our rope behind since all felt confident in climbing the chute without it. I pounded a snow stake into the surface, whence it served as a "barber pole" onto which people anchored their sit harnesses - now just extra weight without a rope. 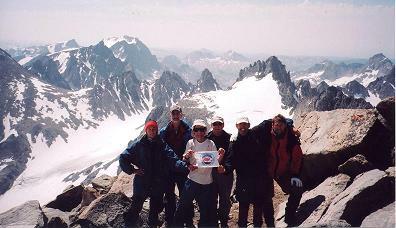 All six expedition members on top of Wyoming. We climbed the snow chute, some 600 vertical feet, all of us, but especially myself, requiring a good break at top. This chute was clearly the crux of our (impromptu) route. GPS readings (45 foot error sphere) indicate the base at 12,600 feet and the top at 13,200 feet. 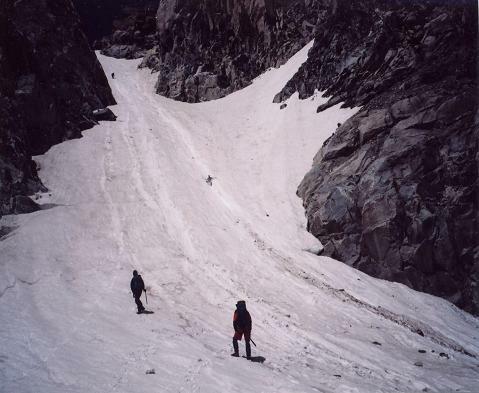 The snow chute taken is shown on the USGS Gannett Peak quadrangle, albeit with less than 600 feet of height due to variations in annual snow accumulation and melting that, of course, eventually result in glaciers. We were now gleefully above the standard crux as the bergschrund of the Gooseneck Glacier. After 100 vertical feet of rock scrambling, we again placed on crampons for the final push - one that included a series of false summits along the summit ridge. Summiting at 11:24 a.m. Mountain Time, Chuck was the first to touch the highest point, followed by Sjaak and a series of photographs. It was a wonderful moment - all six of us had made the top, thanks in large measure to nearly immaculate weather. The highest point is located nearly at the northeasternmost extent of the summit ridge, at UTM (609418 E, 4781946 N). Get to the highest rock or forever suffer a nagging feeling that you must return to finish the job! I enjoyed a cocoa and almond pemmican bar, all-the-while wary of descending that snow chute. We were joined by a party of two and a solo climber in tennis shoes! I don't know if that man was supremely overconfident or a fool unaware of the inherent dangers at-hand. We left after some forty minutes. and more peaks of the Wind River Range. The afternoon sun made mush of the snow. After reaching the top of the snow chute we all took pause and contemplated our fate. Nobody wanted to proceed, and yet without a rope there was no other way to descend. Chuck boldy started out by stomping platforms with his boots, so aiding the remaining people as they very gingerly started downclimbing the chute. The going was intentionally slow and methodical. About two-thirds way down Chuck lost his balance and began a slide. He stopped near the chute base, signaling after several breathless seconds that he was OK.
Next, it was my turn to lose control. As the next person after Chuck, I too found myself glissading downslope, ice axe used not to stop my slide (which was physically impossible), but simply to take advantage of the situation by controlling the rate of my descent and get this chute overwith. I stopped perhaps fifty vertical feet shy of the base, downclimbed the remainder, and then waited for others to follow. In fact it was found impossible to downclimb the snow chute without losing one's balance. And so, in turn, every person uncontrollably fell down and began sliding, with ice-axes used to control our unplanned glissades. Gordon's path led treacherously close to the lip of a moat formed by the rock face melting adjacent snow. The look on his face was of terror, arms flailing completely out of control. He stopped just short of disaster. Soon after we all had made it down the snow chute, a pair of boulders tumbled downslope. One was quite large, the other turning end-over-end at very rapid rate. Had we been descending just minutes later, one of us could have been fatally injured. Descending that snow chute was an exceedingly risky undertaking, and I for one hope to never again suffer a similar experience. I suspect the chute is a good alternative under winter conditions - hard, crusty snow on both ascent and on descent - provided that one is mindful of the avalanche potential. Indeed, later we learned that the route taken is described as "Route 4: Avalanche hazard". Wonderful. We downclimbed the Dinwoody Glacier and negotiated the boulder field, this time taking just 1 hour 30 minutes to cross the latter. Gordon slides uncontrollably down the snow chute. A moat lies just beyond the photo's right edge. We were back in camp at a quarter of six, so making for a 13 1/2 hour summit day. We congratulated one another, and savored our success through much conversation and sense of accomplishment. Chuck kindly offered one of his packaged meals as my supper, a cajun-spiced rice and bean entity. He enjoyed a mexican rice meal. I followed this with vanilla pudding. Although I tried to fall asleep sometime between 8 and 9 p.m, Lidy and Sjaak had taken up residence within ten feet of my tent, and they talked incessantly to at least ten o'clock, all in Dutch, of course. 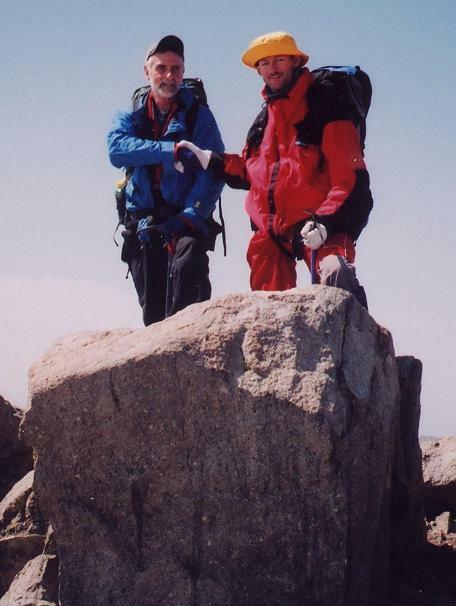 Sjaak and Lidy had an airplane flight from Seattle that suggested only a four day allowance for climbing Gannett Peak. Gordon had the same time constraint since he was to drive them from Wyoming to Washington. Thereby all three "had to" return to the trailhead in one long day. This state-of-affairs arose because Sjaak and Lidy had originally planned upon a five-day climb commencing one day earlier. However Chuck was unable to contact me on my journeys to offer the possibility that we begin our Gannett Peak expedition a day earlier as a convenience to the Netherlands pair. In effect, lack of communication forced us into starting when we did - and straightjacketed Sjaak, Lidy and Gordon into a four day window. Although Chuck, Stony and I had planned on a six day climb, it seemed prudent to walk out with the other three team members. We began the dreaded "death march" with a 4 a.m. awakening, and were on-trail at 5:48. The stream crossings were more efficiently negotiated, and we arrived at our day 1 camp area by 9:40 a.m. I prepared a pint of butterscotch pudding inside a liter water bottle, and, amused by the bright "nuclear orange" color, drank it like so much water with a peanut butter cream granola bar. White hat - Adam Helman. The uphill slog to Scenic Pass was exhausting, seeing as we had just summited yesterday. Chuck led since he was suffering more than most due to what he termed "dead feet". Thus it made sense for him to set the pace. We took the higher of the two possible routes to Scenic Pass, arriving around 2:30 p.m. amidst a mild sprinkle. A well-earned lunch was enjoyed by all just beneath the pass. I had my selection of Chuck's pepperoni and gouda cheese; Stony's sausage and cheddar cheese, and all of this in various combinations on Chuck's pocket bread. We returned to the Ink Wells Trailhead around 5:35 p.m., with twenty-five minutes to spare before the 6 o'clock pickup time arranged previously. An Indian lady came at 5:45 p.m. and we were back in Crow Heart by seven. In Dubois we all attended another restaurant, and I was delighted with the variety of food. My main course was smoked buffalo sausage with grilled onions. As appetizer I enjoyed hot chocolate spiked with cinnamon schnapps. Then came spinach lentil curry soup (I added romano cheese); "cowboy potatoes" (simply polyhedral-shaped french fries); diced corn; a dinner roll; and mountainberry pie with a good helping of vanilla ice cream!! In fact, everybody who ordered pie a la mode (including some very interesting varieties) got a heaping amount of ice cream ... and it was all eaten! Later I learned that Sjaak had treated us, so leaving me slightly ashamed that I ordered something as superfluous as booze in my chocolate. This story is the first opportunity I have to acknowledge his generosity. I took the same room as before the climb, and slept soundly after calling both mother and my climbing buddy Edward Earl (doubtless to boast). Glacier Trail / Ink Wells Trail junction 9,600- feet. Gannett Peak summit 13,804 feet. = 1,920 + 4,204 + 1,840 = 7,964 feet. To this is added one-half the sum of two error bars for the last two elevation differences, arising in turn from the 40 foot uncertainty in trail junction elevation and in the pass elevation. The first elevation difference in parentheses does not contribute an additional error term since both Scenic Pass and the Ink Wells trailhead are higher than the quoted values by as much as 40 feet. Hence their respective errors cancel. Adding the two error corrections, 7,964 feet + 0 + (40 + 80)/2 = 8,024 vertical feet. Thus despite starting at a higher trailhead than the other standard approach routes, the Ink Wells approach still involves substantial elevation gain. Ink Wells does, however, result in a 34 mile round-trip instead of a more arduous 44 mile (via Pinedale and the Elkhart Trail) or 50 mile (via Dubois and the Glacier Trail) round-trip distance. An ascent of Gannett Peak is not to be taken lightly. Since rewards scale with effort, we were all accorded a good measure of both. The climb was particularly sweet for Sjaak van Schie and Chuck Bickes due to their respective list completions.